» At OSU, names hinder success? At OSU, names hinder success? 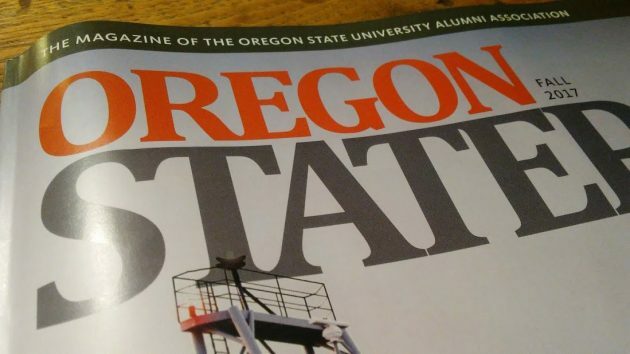 The current issue of OSU’s alumni magazine, in which President Ed Ray explains why he is considering renaming four buildings on the Corvallis campus. As you may have heard, Oregon State University is trying to decide whether to change the names of four campus buildings because of the opinions or actions of their long-dead namesakes. The reason for change, we now hear, is that the names may keep minority students from doing well. The buildings at issue are Avery Lodge, Arnold Dining Center, Benton Hall and Gill Coliseum. Now it may be that a few OSU freshmen actually know who Avery, Arnold, Benton and Gill were. But would they really care enough to let it affect their studies or their grades? Avery was one of the founders of Corvallis now being criticized because of the pro-Southern views of his long-forgotten newspaper, “Occidental Messenger.” Arnold served as an enlisted man in the Army of Northern Virginia commanded by Robert E. Lee. U.S. Senator Benton pushed America’s expansion into the West. And “Slats” Gill, of course, was the basketball coach from 1928 until the 60s who, some are now claiming, resisted integration of his basketball teams. You can find the details on all this here. It’s a website OSU set up on the naming issue. The progressive thing to do is have each building name at OSU come with an expiration date…say 25 years. That way the next generation can determine for themselves whether the name hinders their achievement in any way. Once again Hasso (and my response) address apples, and you deflect with oranges. Hasso’s point is about OSU building names and their impact on achievement. You, for reasons I can only guess at, want to talk about naming rights. If all OSU building names were sold to the highest bidder, that would solve the current issue as well as serve educational needs and/or reduce tuition. Can history be sanitized by changing the name of a building? When will this madness end. Our history is just that ..History, we learn from it but don’t re-write it to make a small minority feel better. Sorry Ed, but it IS exactly an exercise in faddish political correctness. And is NOT going to help with declining retention and graduation rates because it’s something that ALL colleges and universities are dealing with. If anything IMHO, it’s going to increase declining rates because in your attempt to appease 1.3% of your student body, you’re going to alienate 65.0%…and what happens to your political correctness when you do that? Let me tell you Ed, that the average white American is getting pretty fed with all this BS political correct bullying. In fact, let’s call it what it is…racism. I worked at OSU for 24 years and nobody ever raised a complaint about these buildings to my knowledge. When will be get some faculty and administrators with enough brains to stop the madness of political correctness, liberal ideology, and single-mindedness and get back to educating our young people? Sorry to say it, Ed, but you are displaying all the smartness of a liberal moron. Ok since we are into political correctness and changing names how about Washington, DC, Mt Vernon (Washingtons Home), the Washington Monument, the one dollar bill, the state of Washington, the street Washington, after all George did own slaves. How about Jefferson, he owned slaves. If these students cannot stay focused on why they are at a university, they should not be there. The real world doesn’t put up with this kind of nonsense and stupidity. Let them figure it out or fail. Ray should not give credence to any of this, just making a mountain out of a mole hill. Anyone recall the “…nattering nabobs of negativism…”? Thanks for bringing this to light Hasso. History is history as so many have acknowledged here. OSU is a well respected university the whole world over, does Pres. Ray want to meddle in history of these people who gave their all to help achieve the high status the school enjoys? If he continues this idiotic adventure, I would offer my vote to remove him asap! For what it’s worth, my father Tommy Holman played for Slats, and as a young boy Slats was the man besides my Dad that I looked up to because of all the great things my Dad and other fine folks would say about the great Slats Gill. The very fact that Ed does not even know he is participating in absurd political correctness means he is out-of-touch with reality. Reminds me of the orchestra leader on the Titanic trying to decide what to play next. It is really illogical thinking building names affects student academic performance. No data exists to support this stance. Thanks Hasso for the Coliseum example. I know alumni who have stopped all contributions to OSU because of this crap. When the solicitor was told why—he said “you are not the first one”. Let’s concentrate on what is important for our minority students and everyone – BEST EDUCATION. I was pleased that the donor for the Oregon State library was named Valley. Perfect for a name. Same with Benton for a hall. Speaking of names, there is a major time for changes. The marketing director was in a tizzy one day. Panic. A new billboard for OSU would look terrible. The URL was http://www.orst.edu. In large print, it read “worst edu.” We immediately changed the name to http://www.oregonstate.edu. I like the idea of reviewing the building and field names every 25 years. Well, let’s continue changing names of places based on folks who contributed to the conquering of the New World, or who during their life time spoke against other cultures or were against homosexuality. The following names have to go. Shall we keep going down this path? This and similar – call it politically-correct nonsense if you wish – has one major, deleterious effect. It’s a recruiting tool, a tiny grain of truth wildly exaggerated by the delusional wing of the far right, more quietly ridiculed by rational conservatives. It probably helped nominate and elect President Trump. If this is what Ed Ray wishes to further, he knows how to decide. Obviously a slow, post-Labor Day effort by Hering to gin-up some readership excitement. The question is, why do so many write-in to tear down a university president because he wants to rename a couple of buildings. Why does anyone care what goes on at OSU? Everyone knows Oregon was and remains, a racist place. Everyone knows the awful history of Oregon and race relations. So the question one must ask Hering and those who so ardently support his reactionary thinking is, what exactly does he fear when a college president says he might change a few names? Because it’s a stupid idea. And a college president should know that there is zero correlation between a building’s name and a student’s academic achievement. Ed has become Winston Smith of “1984.” As a true progressive pioneer he may overcome any doubts left and get to love Big Brother. No, everyone does not know nor believe that. The same statement can be said with as much accuracy about any country, any nation, any population in the history of civilization. I know that I was brought up and taught by my parents in the 60’s and 70’s to treat all people as individuals regardless of race or religion, that men and women should be given equal opportunity, that sexual orientation does not matter. Rather, I should assess people by their actions, to befriend all, to have compassion and strive for empathy for others. I believe I do so. I believe most of my friends do as well. This is not to say that I can know what it is like to walk in another person’s shoes. I recall back in the 80’s when I was first out of college. My wife and I lived in an apartment and directly across from our door was a neighbo7r, a nice lady we got to know. She was perhaps 20 years older than us. Her name was Daisy and she moved to the West Coast from the South a long time before that. We became friends, watched shows together, I recall taking her to a doctors appointment a time or two. Being fairly young and naive, my eyes were opened a bit, when she told us that where she came from, we would not be able to do these types of things together. That is, we could not be friends. Society would not allow it. She would be hassled by her African American friends, we would be hassled by ours white friends. She loved the West Coast, where she could be friends with whoever she wanted without being judged or harrassed. She stated she never planned on going back. As I was raised far differently than this, I thought that the entire USA was the same as my upbringing in Oregon, and that such prejudices only existed among the elderly. I learned since, that alas, this is not the case. I do not bury my head in the sand and pretend that prejudices do not exist. But neither do I allow stereotypes of any race or gender to color my thoughts and interactions. I do not classify an entire group of people, or an entire region as racist, that is in itself the definition of prejudice. I tend to agree that we shouldn’t be changing history, however, as it pertains to the Civil War monuments that were constructed during the Civil Rights era I absolutely believe those should be removed. They were erected with the purpose of bigotry and division.